When you want the best in hot tub experience, you want a gunite spa. Purchase one today or have an architect design one nestled between trees and waterfalls, and you’ve got the ultimate in relaxation. Custom built spas can truly transform your outdoor space into an oasis. Known for its durability and reliable structural strength, gunite is a concrete blend of water, sand and cement that’s applied through a high-pressure hose. Once it dries, gunite becomes rock hard, forming a thick, solid structure. For years, it has been a hot trend in swimming pool construction, where it is combined with another strong building material, like steel, along with an interior finishing coat of plaster. Today, a gunite spa is all the rage. The custom gunite in ground hot tub has become highly popular these days, and it’s easy to see why. Here are just some of the advantages. You can have a custom design and shape that suits your landscape. Custom built spas made with gunite can be built in any size or shape, which means you can have exactly the right design for your outdoor landscape. You won’t have to worry about redesigning your landscaping. Instead, your gunite spa can be made to fit in with your existing landscape design. You can choose the finish materials to personalize your spa. Gunite plaster finishes come in a variety of finishes and colors, so you can easily coordinate your in ground hot tub to blend beautifully with the rest of your landscaping. You even have the option of choosing finishes made from pebbles or glass for a more luxurious look. Your gunite spa will be built to last. Gunite custom built spas are extremely durable. Among the many types of hot tubs available on the market today, gunite lasts the longest and has the best warranties. Gunite provides a result that endures – a stable, steel-reinforced concrete structure that holds water and stands the test of time. While the investment is a bit more, you’re getting many more years of use from a gunite spa. Along with boasting longevity, what is gunite construction’s next-best benefit? Flexibility. The reason comes down to the shifting ground. Never entirely static, soil under and around an in ground hot tub moves in place, contracting and expanding due to compaction, water intrusion, thawing and freezing, and dry conditions. The gunite shell can easily stand up to the pressure that any backyard dishes out. Millions of gunite custom built spas across the country offer relaxation and visual appeal in residential backyards. Countless more provide the same at hotels, schools and community associations. With its stellar resilience and undeniable good looks, a gunite spa delivers tremendous value. Now that you know the answer to the question, “what is gunite,” and see the possibilities of its design versatility, it may be time for a lasting upgrade for your lifestyle. 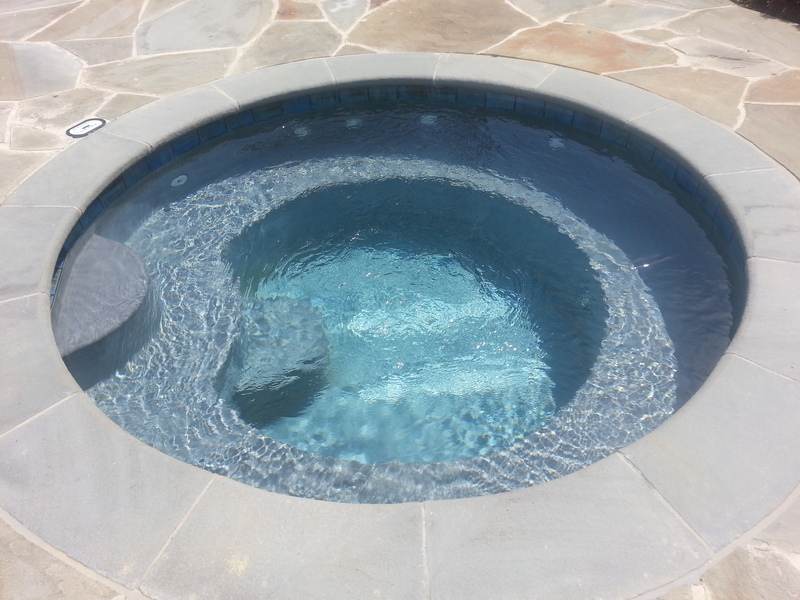 It might be time to consider adding a gunite in ground hot tub to your space.